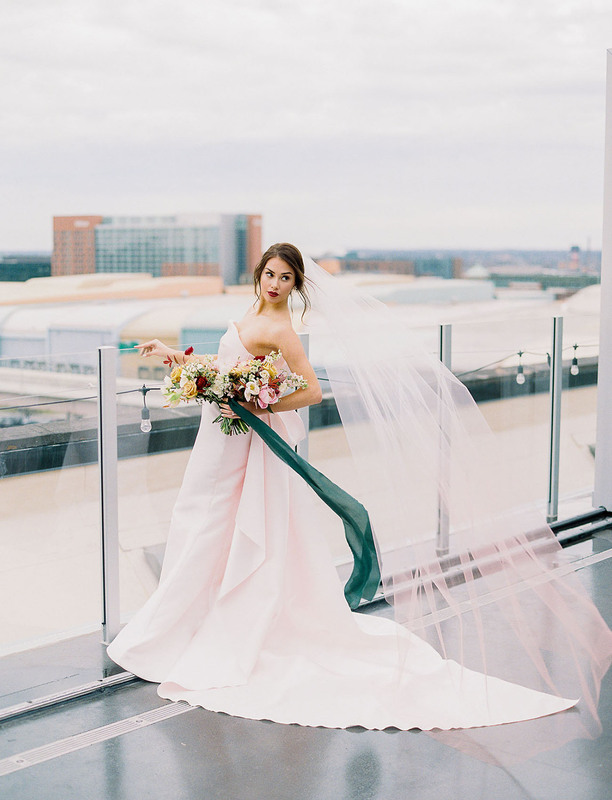 This editorial collaboration was inspired by the sweeping city view from Juniper Rooftop, a new Columbus, Ohio venue. 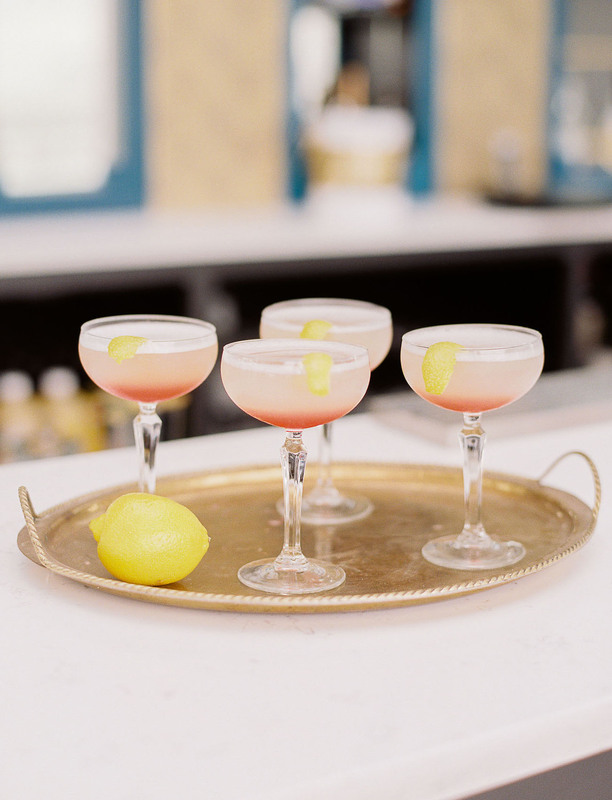 Keeping the rooftop view a priority, we created a story that is both warmly romantic and briskly modern. Our warm and feminine color palette was a conscious choice to soften the crisp architectural nature of the space. 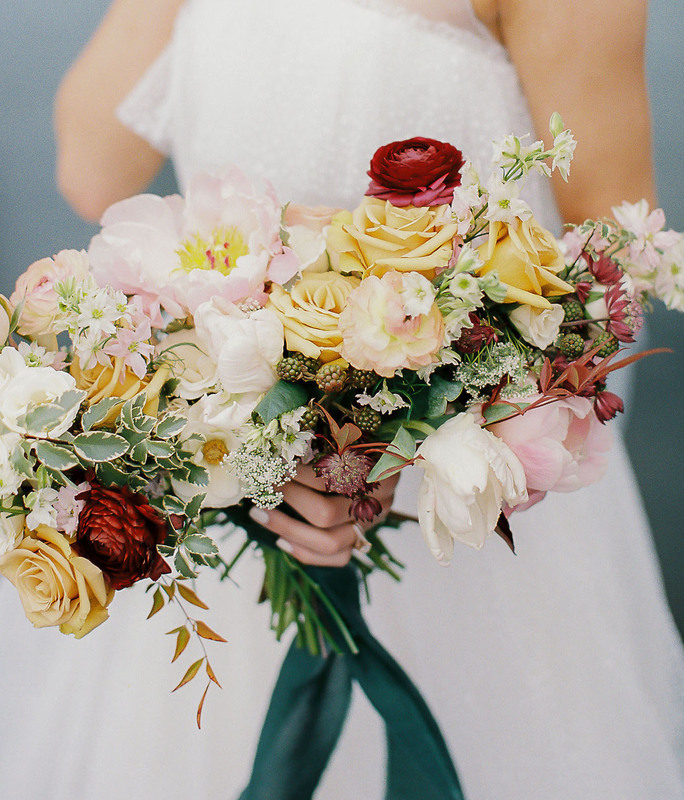 Hues of tea rose, dijon, slate, linen, burgundy and palest pink evoked all the nuances of a rooftop party in spring. 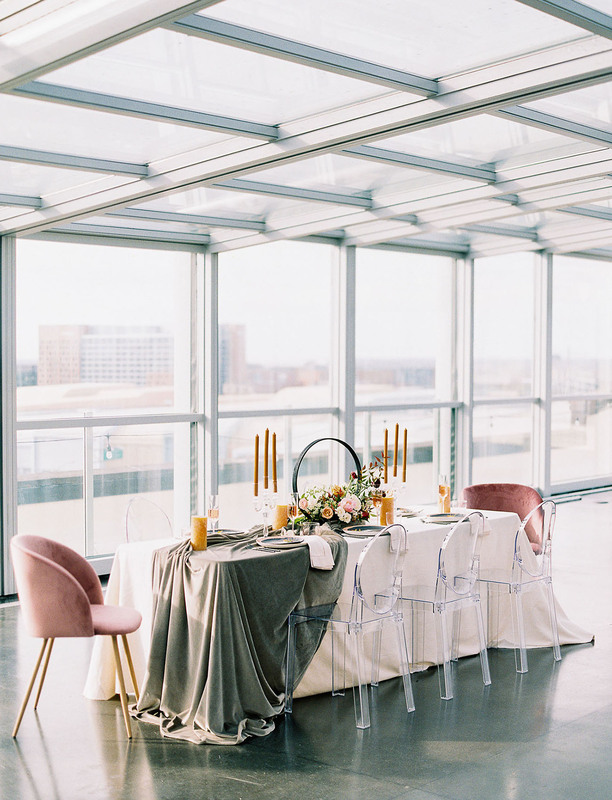 This shoot was a fantastic opportunity to show off our beloved city from a brand new vantage point, with all the details to inspire brides with romantic and modern sensibilities alike. 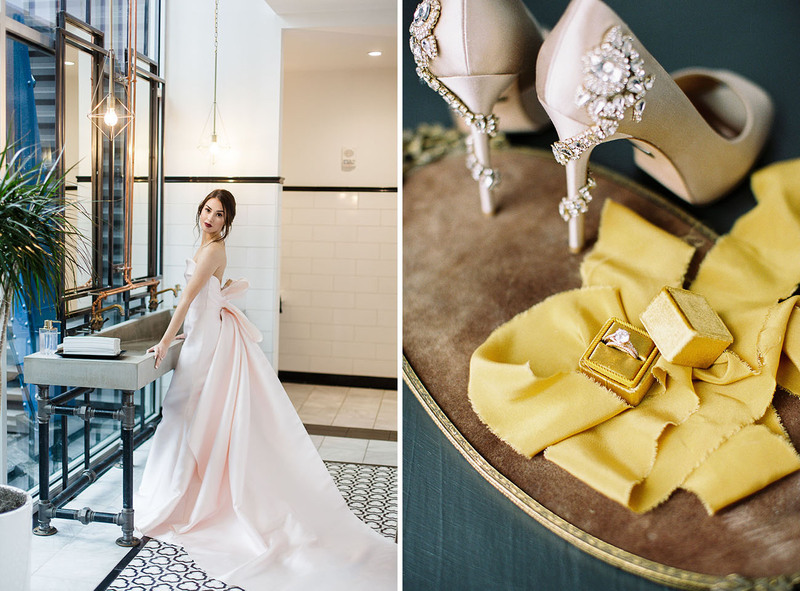 Jenny Haas captured the romantic elements in gorgeous detail—you have our permission make like Audrey and grab a coffee and a croissant before digging in to this lovely editorial! 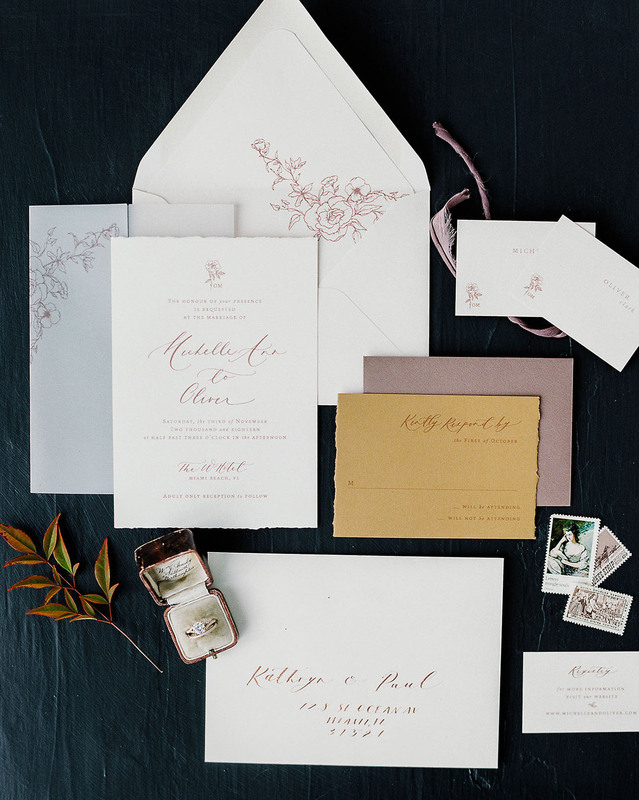 Florals were the major design element of the day, as carried out beautifully in an enchanting floral invitation suite by Natalia from Papel + Co. How gorgeous are the rose gold foil details? So dreamy! 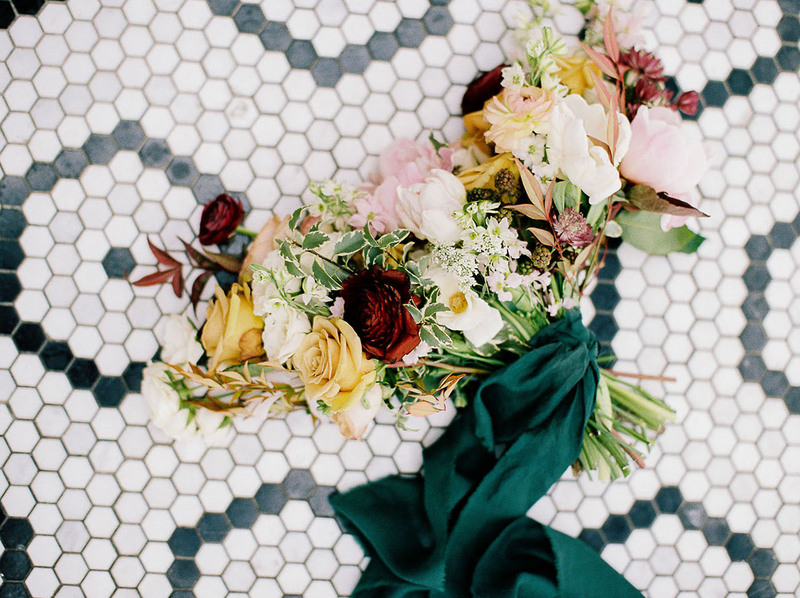 State + Arrow wrapped the bride’s bouquet in a rich-colored naturally dyed silk ribbon by The Lesser Bear. A vision in pink! It’s not Audrey Hepburn style without a bit of glam, expertly illustrated by makeup artist, Angie Warren. A la Audrey Hepburn in Funny Face, innocence and elegance diverge in modern romantic fashion. 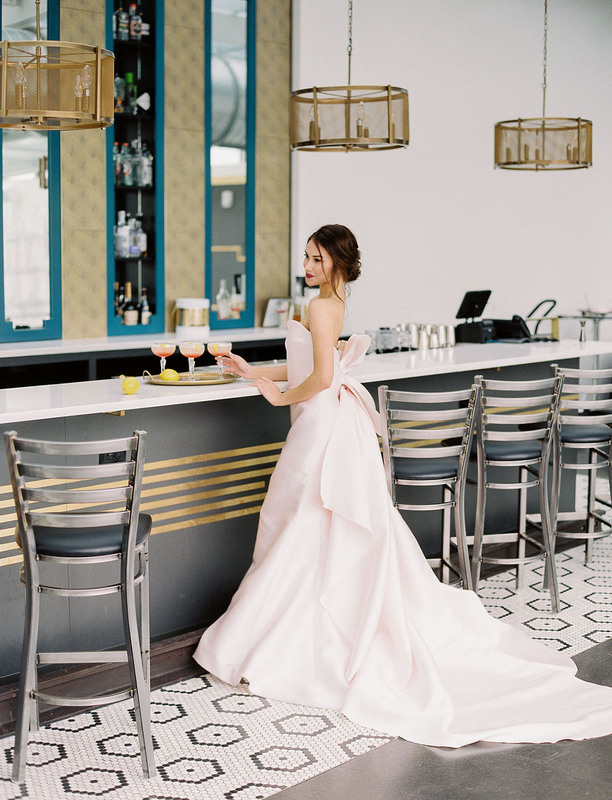 Rivini’s gorgeous pink satin gown (Rita Vinieris “Chic”) from La Jeune Mariée is a nod to the classic film’s “Think Pink” song. Ooooh! The texture of the sage velvet runner from Event Source is simply dreamy! 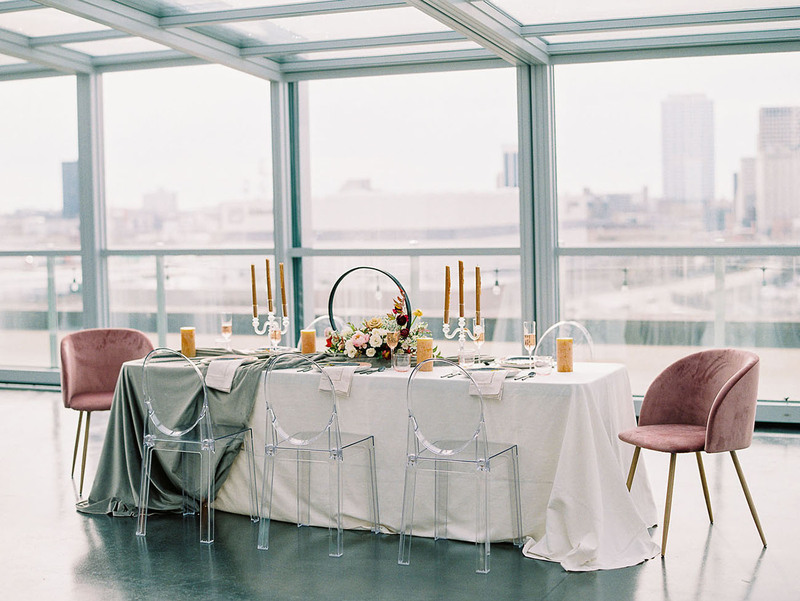 The ghost chairs from Antiquity Rentals and crystal candelabras kept the city panorama intact, but State + Arrow‘s floral centerpiece was perhaps the most spectacular preservation of the view. 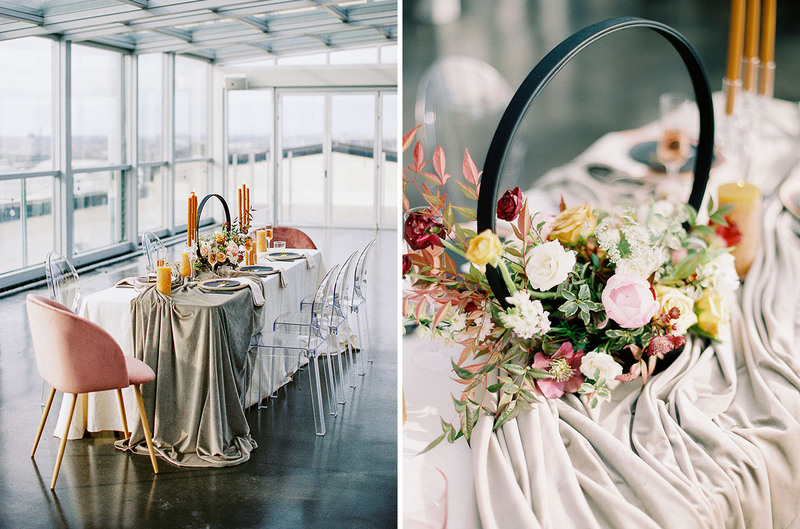 The circular hoop was the innovation of florist, Adria, made to stand alone as an incredible floral statement while still showcasing the rooftop scenery. 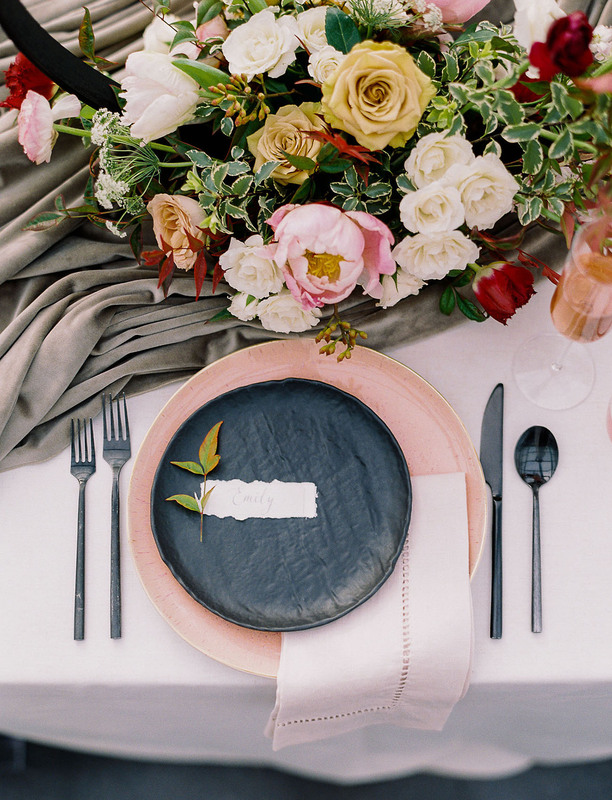 The tables were topped with black accents from Aiden + Grace and pink plates from Anthropologie. 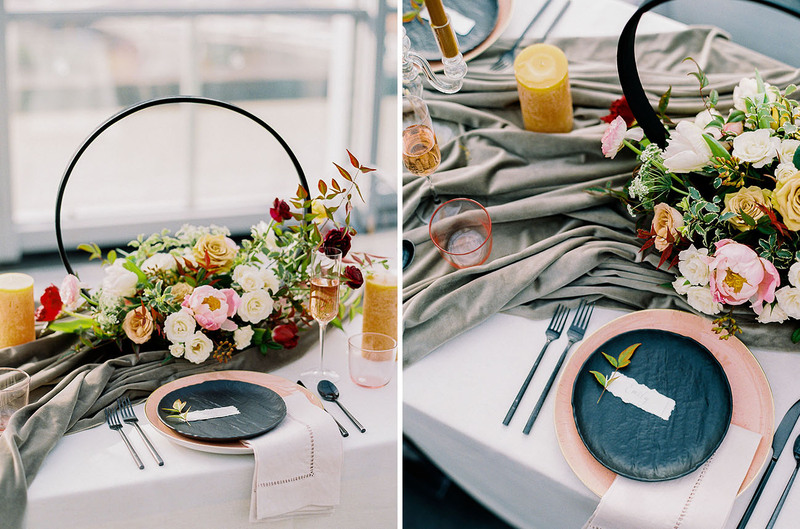 The circular floral centerpiece adds such an interesting dimension to the romance of the table, right? WOW. 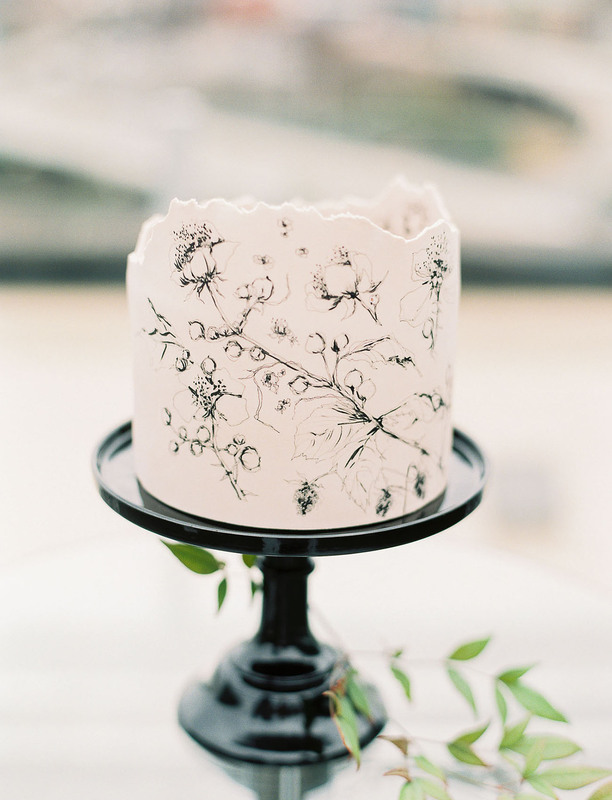 Cake designer Miam Cake echoed sketches of florals onto her simple but incredibly chic cake! ‘Top’ it off with a pink ombre veil by Sara Gabriel! 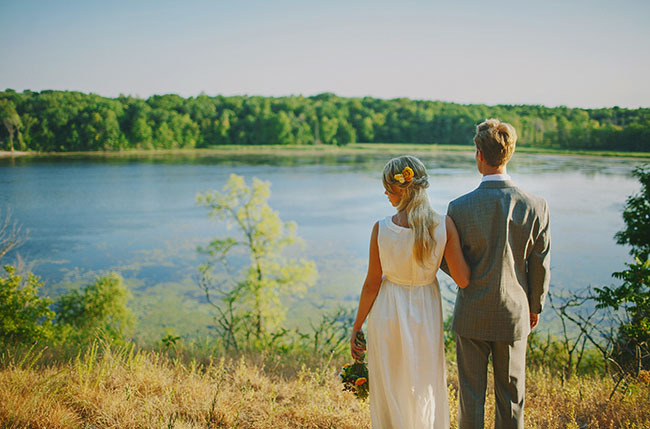 So many beautiful ideas and dreamy situations in this editorial. Lovely work by the entire team!